In this photo published in a recent PDF, we can see results after 3 months. I dunno, the direction of the new hairs looks a bit chaotic, isn’t it? » I dunno, the direction of the new hairs looks a bit chaotic, isn’t it? Spanish dude, I mean this with all respect when I ask, why does direction matter that much except for on the hairline and at the vertex where it seems really important. Couldnt you figure out ways to style the hair no matter the direction it grows, I mean if they dont get the growth directions correct? Again, I’m asking this respectfully just to hear your opinion because I’m legitimately interested, I’m just verifying that because it seems like people get in fights on this forum over the slightly comments, I just want to hear your honest opinion. I think direction is very important if you want a decent looking hair. and there will be weird bumps in your hair, like those days when you wake up and your hair looks horrible and you have to wash it. Once you have washed it, all the hairs can synchronize nicely, and it looks beautiful. Not only at the hairline, and the vertex. You need good synchronization everywhere. I don’t know about styling gels, because I have never used these. You can probably correct the problem to some extent, but I wouldn’t want to use them. It would be interesting to build a prototype head and simulate the effect of bad direction of hairs. Some people say that direction will correct over time, but I have my doubts about it. » » I dunno, the direction of the new hairs looks a bit chaotic, isn’t it? » comments, I just want to hear your honest opinion. I don’t know what that means if the hairs are growing out at angles that are not predictable based on the injection angles. That could be very bad. The good news is that really does look like a commercially viable improvement in hair growth (assuming many repeat passes on the area are possible) and the hairs look terminal. Sorry guys but actually i dont care which direction the hairs take, when you see closely these are brand new hairs and in a huge mass it doesnt matter which direction. And you know what if i could get a full head of hair i woulnt effin care for the direction because you can use hair spray and gel all the effin time. » are not predictable based on the injection angles. That could be very bad. » possible) and the hairs look terminal. Yes, that would be bad. Remember that trialist Thomas Tank told us, that ARI injected him with the syringe placed at a precise angle. So it looks like the injection angle doesn’t translate very well into follicle angle. Also remember the pig trials. The cells were injected on laser-created cavities, and using matrigel as scaffold, but all hairs were ingrown!! In mice, directions were random (several hairs per injection). So direction seems a difficult horse to ride. On the positive side, the picture is just 3 months after injections, and there is a substantial increase in hair numbers. Leeroy, the direction really IS important. Just talk to anyone who got HT work from a chop-shop that got the direction wrong. If we want this to look like naturally occurring hair this is not something to ignore. It’s a frustrating thing to hold up the process, but it would be even more frustrating ARI’s whole project sank because of bad feedback from the early patients. Their early rounds of HM probably won’t give anyone back their thick 14yo density, and that kind of partial-density coverage will magnify the problems caused by growth direction flaws just like a conventional HT does. ARI must not be ignoring the issue either. The pig trials were ingrown and the human trialists are carefully injected at certain angles. They are putting effort into this, the question is whether or not the results are paying off. As with most of our questions, the answer will have to wait for at least the phase#2 trial results. Before then it’s all purely speculation. are you sure that gel will be enough? If your hair is cut short, gel won’t be enough, unless you use cement. This would explain why ARI said that Ji-Gami is not valid for the hairline. On the other side, trialists BaldHalfTruth and Thomas Tank have said that direction is normal. » the phase#2 trial results. Before then it’s all purely speculation. » are you sure that gel will be enough? » If your hair is cut short, gel won’t be enough, unless you use cement. how short is your hair? it will also depend on how strong it is. Just imagine your beard hairs growing in random directions. » » are you sure that gel will be enough? » » If your hair is cut short, gel won’t be enough, unless you use cement. » how short is your hair? » growing in random directions. Good point Spanish Dude. I am also concerned with the quality of those hairs. IMO, they do not look terminal. I think both the hair quality and the growth direction issues are a result of ARI’s cellular approach. Histogen’s photos, on the other hand, showed consistent direction (if I remember correctly) and better terminal growth; however, I find it highly unlikely that Histogen is producing entirely new follicles as opposed to repairing existing. Let’s just hope, by some miracle, that one or all of these treatments magically works and gets to market asap. There is a rare disorder that causes scalp hairs to grow in different directions. Such people have hair that is impossible to comb and which tangles and matts. As for using gell–a dirty and unmanly recourse. But, worst case: if they can’t solve direction problem, then maybe ARI can still be used by having FUE done to re-orient the follicles in the correct direction. Expensive and troublesome, yes, but it would beat being bald if you have the money (and beat using gell or hairspray or some other gunk to glue the hair in place, if you could even comb through the tangles first). Thanks, Ahab, I always put high value in your oppinions. Tangling is another consequence that I expected from differently oriented hairs. Regarding using FUE to reorient the hairs, ouch, that would hurt the pocket, and we would have to choose a good surgeon, and choosing a good surgeon is not easy. I wouldn’t like this route. If the direction problem is confirmed, then growing protohairs would be a way out, but unfortunately, ARI is not currently able to grow them, and what ICX said about protohairs is not much credible anymore. » As for using gell–a dirty and unmanly recourse. » hair in place, if you could even comb through the tangles first). » I’d go for it. 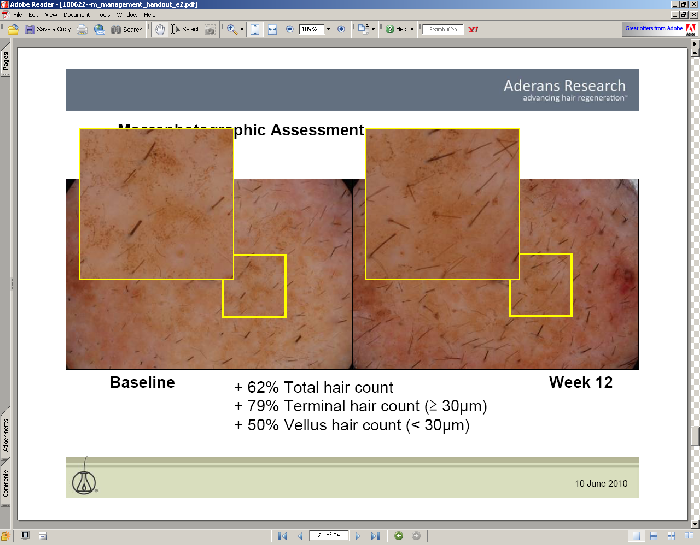 Yes, all in all, Histogen seems to be producing better quality hair, BUT note that the photo from ARI shows a patient who was very bald before treatment, while Histogen has shown photos of patients who were relatively hairy. So it is difficult to compare both. » hairs. IMO, they do not look terminal. » follicles as opposed to repairing existing. » magically works and gets to market asap. Its difficult to believe that gel could manage this situation (3cm hair, with random directions). But I will have your opinion in mind. » » how short is your hair? » » growing in random directions. If true, wouldn’t that make it more likely that what they are getting is new follicles, as opposed to the rejuvenation of old follicles?